With the constant evolution of technology in today’s modern vehicles and an increasing number of accessories and options available, setting up a dual battery system can feel more daunting than ever. And one of the main stumbling blocks when selecting the type of equipment you need to correctly charge and maintain your auxiliary batteries often depends on the type of alternator found in your vehicle. But what is the difference between smart alternators and fixed voltage alternators? Is it as technical and scary as you think? Fixed voltage alternators are becoming less common on new vehicles as reduced fuel consumption targets and more stringent environmental and emissions standards are adopted by manufacturers. A fixed voltage alternator has a high enough voltage to charge a secondary battery in the vehicle to a usable level for leisure or auxiliary use. The smart alternator system, also known as variable voltage alternators, allow the vehicle to control the output voltage and current from the alternator based on vehicle operating conditions. The idea behind this is to reduce electrical load and in turn mechanical load on the engine by the alternator. Unfortunately, this renders it unsuitable for charging a secondary battery system to a usable level. How do I tell if I have a smart alternator? Smart alternators are par for the course in most modern vehicles, but when measuring or monitoring output voltage from a vehicle with a variable voltage alternator you will find the voltage can range between 12.3V-15V. It’s not easy to tell if it’s a variable voltage alternator by only measuring voltage as sometimes the result may be deceiving or look similar to a standard alternator at time of testing. A good way to determine whether your vehicle has a variable voltage alternator is to look at the vehicle start battery. What you are looking for is a module mounted on or close to the battery terminal (usually the battery negative). This is the battery sensor, if it’s got one of these, you have a variable voltage alternator. How does a smart alternator affect my dual battery system? The operation of a variable voltage alternator when paired with your dual battery system can have some unforeseen or detrimental effects on the operation of the dual battery system and the auxiliary battery. With variable voltage applications there are situations where your start battery is fully charged and once this is determined by the vehicle’s Engine Control Unit (ECU), can reduce the alternator voltage. This is done to reduce the load on the engine, reduce fuel consumption but primarily to reduce vehicle emissions. In this situation if your voltage sensitive relay (VSR) is off, your auxiliary battery will not receive any charge (even if you override your VSR to stay on, the voltage will be too low for any useful charge into your auxiliary battery). The result is a shorter run time for your auxiliary loads and a reduction in battery life. As a starting point, you must ensure your dual battery system consists of the correct equipment that’s compatible with variable voltage alternators. Can you use a battery isolator with a smart alternator? With the way modern vehicle technology is constantly advancing, relying on the alternator and a simple battery isolator will not provide the auxiliary battery with adequate voltage to charge effectively. This is the main reason why the REDARC BCDC Dual Input DC-DC chargers are required in these applications as they are the only way to ensure you are maintaining your auxiliary batteries to 100%. What is a DC charger and why do I need one with a smart alternator? The Manager30 battery management system is the premium option which gives you the ability to charge and maintain your auxiliary battery via vehicle, MPPT solar and 240V mains inputs and comes with a remote monitor which provides all the information you need to keep an eye on managing your power. Both of these options have green power priority technology which utilises the available solar power and can charge from both solar and vehicle at the same time reducing the load on the vehicle’s alternator. 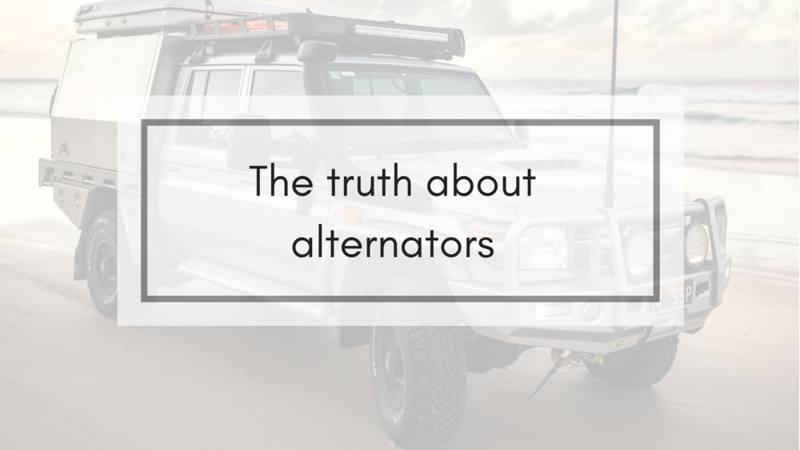 So there you have it, the not so scary truth about alternators. And the most important thing to remember is that no matter what your vehicle setup is or the type of alternator you have, there’s a suitable vehicle battery charging product to suit your needs simply and easily. Which auxiliary battery do I need? What battery charger do I need?